Read more for a summary of what to expect from this new ordinance. On June 9th, 2017, the Borough of Deal passed Ordinance #1152 which expands its public beach from Marine Place to Neptune Avenue. The swimming zone will be located between the Hathaway and Marine jetties, and by law, will not exceed 300 ft. in width. The surfing break from the L jetty to the Hathaway jetty will remain untouched. 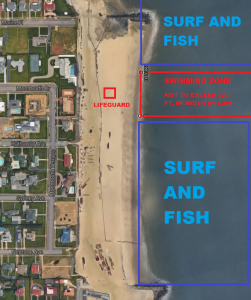 Surfing and fishing will be permitted outside of the swim zone at all times, and within the swim zone when the public beach is closed. The beach fees at Monmouth Terrace will be the same as the borough’s Conover Pavilion: $8 for a daily pass on weekdays, $10 for a daily pass on weekends and $150 for a season pass. Hours for Monmouth Terrace beach would be 10 a.m. to 6 p.m. Beach fees and lifeguards will be in effect from Memorial Day to Labor Day. There will be one lifeguard on duty in front of the swimming zone. Parking remains free. As the Mayor admitted today, pursuant to Federal and State laws, parking restrictions will be not implemented. Surfers, fisherman and those that wish to walk the beach below the high tide mark and pass through will not be required to pay for a beach badge by law. You will only pay if you are sitting on the municipal beach or swimming in the “swimming zone” under supervision of a lifeguard. You have a right to access the high tide mark without getting charged. The addition of beach fees seemed inevitable thanks to the Army Corps’ replenishment project. Larger beaches will attract more people who want to access those beaches – as is their right – and many of those people will want to swim in the Atlantic. In this way, Deal is following the habit of most other towns in Monmouth County. This ordinance legally grants access to more people than before while maintaining free parking. The Jersey Shore Chapter of the Surfrider Foundation is committed to making sure that policies in Deal, and all shore towns, are consistent with the Public Trust Doctrine and the Beach Fee Statute. We feel that this Ordinance accomplished those goals. Free parking, limited swimming and free and unrestricted surfing at the L jetty break.